Mark Corroto over at All About Jazz gave A TRI-FI Christmas a glowing review saying it just might be “this year’s finest jazz Christmas offering.” That’s some pretty high praise and we’re mighty excited about it! “Every Christmas there are volunteers sent to save us from the wrath of Burl Ives. They are called jazz musicians. Everyone loves a bit of schmaltzy music a few days before the holidays, but the only problem these days is that the holiday begins right after Halloween. Sixty days of grandma getting run over by a reindeer can make you suicidal. This year’s finest jazz Christmas offering might just be by pianist Matthew Fries, bassist Phil Palombi and drummer Keith Hall. 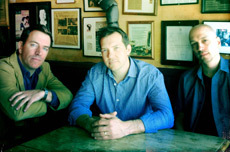 Known as Tri-Fi, this piano trio has released three previous titles, the last being aptly named 3 (Tri-Fi, 2010). It’s a sort of modern-day blue-collar band that has absorbed the history of the piano trio from Horace Silver and Ahmad Jamal to Jacky Terrasson and Aaron Goldberg. When not performing acoustically, Tri-Fi backs vocalist Curtis Stigers. That certainly explains the ease in which the group interprets sing-a-long tunes like the fast-paced and swinging “Frosty The Snowman” and “Let It Snow,” where the trio reinvents Sammy Cahn’s lyric, playing it against the melody of Quincy Jones‘ “Killer Joe.” It is enough to make mommy giddy after kissin’ Santa Claus. The band turns toward New Orleans on “Joy To The World,” with Hall delivering a natty drum shuffle. Fries is free to preach the piano gospel here, and also on “Go Tell It On The Mountain,” which ends with some hand claps and tambourine inspiration. The trio evokes memories of pianist Vince Guaraldi with “In The Bleak Of Winter.” Like Guaraldi’s Christmas music, the trio delivers a sparse, and tender offering. The highlight of the disc might be “We Three Kings,” performed as if imagined by pianist McCoy Tyner. The band draws from the sound of saxophonist John Coltrane‘s A Love Supreme (Impulse!, 1965), lifting the bandstand with the ferocity of Fries’ playing and Hall’s energetic return.